"Le vent se lève, Il faut tenter de vivre." The wind is rising, we must try to live. For centuries, man had wanted to defy gravity and soar through the skies. That dream turned into reality in the 20th century thanks to the Wright brothers. People soon flocked to become aviators and aeronautical engineers in the hopes of pursuing their dreams, but what was soon to follow were two world wars which turned those dreams into cursed dreams. The Wind Rises is not only a look into the moral qualms of a person who worked in the aviation industry during those troubling times, but it is also a swansong for Hayao Miyazaki and a perfect one at that. The Wind Rises is a story that is loosely based on the life of a Japanese aeronautical engineer named Jiro Horikoshi. Jiro has always wanted to fly airplanes since he was young, but he decided to change course because of the fact that he is nearsighted. He makes it his ambition to one day become an aeronautical engineer so that he could turn his dreams into reality, and that is to bring airplanes to life. Jiro's dreams, however, starts turning into cursed dreams. He starts having moral qualms and has to design planes for the World War. Whilst in the midst of his occupation, he also starts developing a relationship with Naoko Satomi, but even their relationship is bound to end in tragedy. Out of all the films that Hayao Miyazaki has created, this is his most personal one. 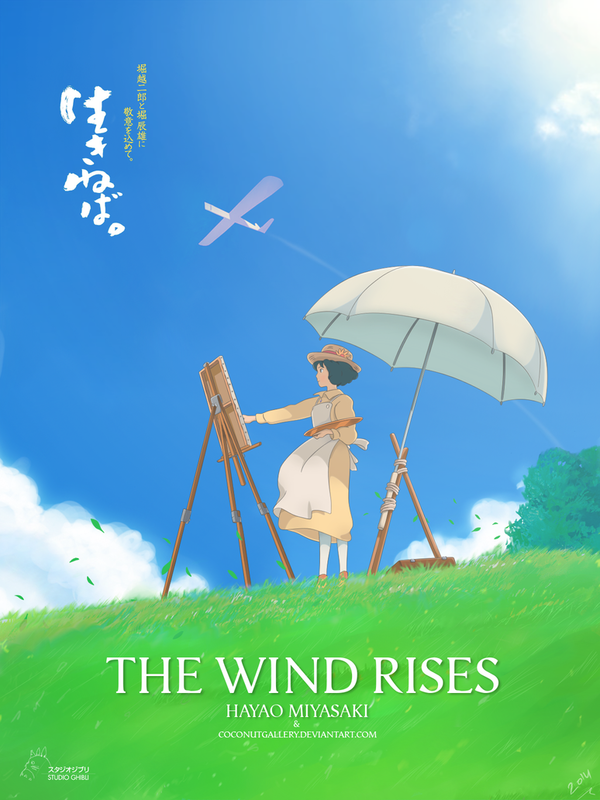 In a way, The Wind Rises is a story of not only Jiro Horikoshi, but also Hayao Miyazaki. In this film, we see elements of pacifism, nature, love, and flight. These are all elements which Miyazaki really holds dear. The film never really focuses on the war because Ghibli wouldn't have been able to get away with that kind of film if they did. It's a delicate subject when it comes to Japanese nationalism, but the film has in no way, mitigated the effects of World War II. It shows the effects of the war through Jiro. Jiro Horikoshi was the one who designed the Mitsubishi A6M Zero. An aircraft that would later have several variants so that it could carry out more attacks during World War II. But these were aircrafts that were also used for the attacks on Pearl Harbor and the kamikaze attacks. This story is built as a tragedy because it is meant to show what Jiro's dreams had achieved. All he wanted to do was create airplanes. It was never his intention to send pilots to their deaths. "I am taken aback by the lack of knowledge among government and political party leaders on historical facts." ... Miyazaki was born in 1941 and wrote... about his memories of World War II and its aftermath. Miyazaki wrote that he was ashamed and felt "hatred against Japan" for what the country did in China during the war, and said that Japan should apologize and pay compensation for its crimes during the war." This film never really sticks to one storyline and neither did it really have a climax. The romance served as an accompaniment for the tragedy. It's very similar to how Jiro treats his work. He doesn't care if Naoko has tuberculosis because it won't prevent him from loving her. The ending for the romance can be emotional for some, but it's meant to make the viewers ask if it was truly necessary for the film. It draws a connection to Jiro's work because the same question can be applied to what he is doing. Is it truly necessary? Because all he is doing simply trying to pursue his dreams. Just like Jiro, Miyazaki is just simply trying to articulate his dreams and create something beautiful. He has succeeded in his artistic pursuit, but it has always been in his mind to reflect on the moral complexities of himself and Japan's history. Although it doesn't handle its themes well, The Wind Rises is a perfect swansong for Hayao Miyazaki because it is a work that reflects on who he is and what he is like. Joe Hisaishi has done it once again and has composed a splendid score for The Wind Rises. The classical music fits the themes of the film very well and makes the scenes all the more amazing. the use of microphones. This is most evident in the sounds of the wind, engines and the earthquake. This film may not have the best visuals of out all the Ghibli films, but it manages to retain the imaginative aspect which they all have. You can really feel this film because of the animation. Airplanes are brought to life and the characters' emotions are defined by their movements. The 1923 Great Kantō earthquake which killed 142, 800 people is also portrayed in a unique way to make the viewers know how much of impact it brought to Japan. Some parts of the art are simplistic, but it is thanks to the animation that this film stands out and balances the visuals. The landscapes are beautiful, colors are vibrant and many scenes are well grounded in art and animation. There is a misunderstanding in this film when it comes to Jiro's character. He is not really apathetic, but it is meant to seem like he is. He is put in several situations in order to show that point. He's just a normal person doing his job and pursuing his childhood dreams. One way or another, he would have been working for the war because of the time and society that he lived in. The ending shows us that Jiro actually cared about what he was doing. He regretted it and even contemplated death. This film is really just trying to show how much of a disconnection there can be when an individual's creations are used for something as horrifying as killing. "In October 1944, Kamikazes became known to the nation via the newspapers and the Zero was announced soon after to be part of this operation. Jiro was approached by the press to write a short essay on the Kamikaze, but he declined. He found it too emotionally difficult to think when he looked at photographs of smiling pilots boarding Zeros, knowing they were doomed to death." Although many of the characters were great, their relationships with Jiro could have been explored more. But it definitely would have made the film a lot darker and mature which is something that Hayao Miyazaki does not like doing. Honjo is a great character because he expresses our thoughts on what is it that they are doing and creating. Unlike Jiro, Honjo acknowledges the horrible things that their aircraft are being used for. Then there is Count Caproni. He is parallel to Jiro because they both pursue the same dreams, but while Count Caproni knows of the price that comes with that dream and even comes to the point of questioning Jiro, Jiro just simply replies by saying; "I just want to design beautiful planes." There are also two supporting characters in this film that give a message of living life to the fullest. The first is Castorp who criticizes Nazi Germany. He acknowledges his doom and so he chooses to live his life to the fullest. The second is Naoko who despite having tuberculosis, still chooses to live life to the fullest.